Minister of Solid Minerals Development, Kayode Fayemi, has reacted to the commission of inquiry set up by the Ekiti state governor and his successor, Ayo Fayose, to probe the finances of the state during his tenure as governor of the state from 2010 to 2014. Fayose constituted the eight-man probe panel yesterday May 22nd. In a statement issued by his Special Assistant on Media, Yinka Oyebody, Fayemi described the commission of inquiry as illegal and efforts to probe him through it as an exercise in futility. He pointed out that there are two cases pending in court concerning the planned probe of his administration. Fayose inaugurated an eight-man commission of inquiry in compliance with the resolution passed by the State House of Assembly on May 10th directing the governor to set up a panel to probe Fayemi. 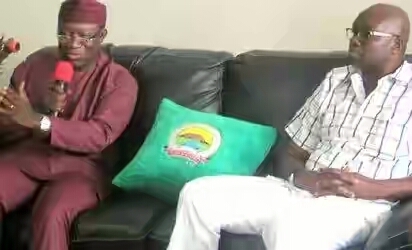 0 Comment to "Stop pursuing vendetta against me- Kayode Fayemi reacts to Ayo Fayose's probe panel"